PhD (2017) Human-Computer Interaction with a minor in Industrial Design, Georgia Institute of Technology. 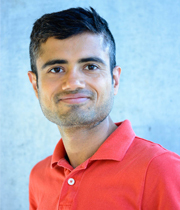 Aman Parnami recently received a PhD in Human-Computer Interaction with a minor in Industrial Design from the Georgia Institute of Technology. Prior to that, he has completed a Masters in HCI from the same institute and a dual degree in CSE from IIT Bombay. He had interned with Microsoft Research in Redmond and Intel in Hillsboro. His research interests include the development of rapid prototyping tools for novel wearable interactions and devices. Furthermore, he is passionately involved in the design of constructionist learning environments for CS courses. Besides academics, Aman regularly trains for the marathon and enjoys hiking as well as biking.